BIO: My life waiting to be Batman. College Of Art in 1987. I currently live in Orlando Florida. was so excited. I would finally be Batman. started out by drawing superheros. 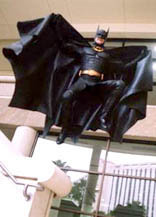 the Batman Returns Cowl the best. That would be my mask. I need that mask. need for such foolishness or vanity. Plus Cat Woman is only in Returns. did this for me and so I started sculpting my mask on my plaster head. the fact that my head was a slightly different shape than Keaton's. This is my first Batman cowl sculpture. 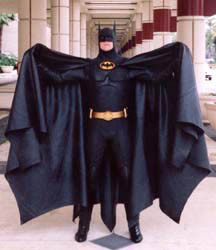 I completed it in 1993 and went on to make a Batman costume for myself. Back then that was the only way you could get one. 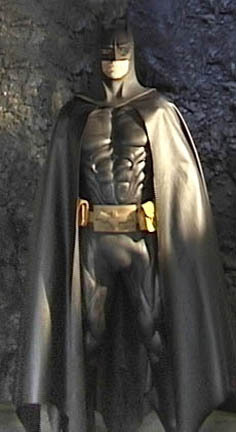 I am a fan of Batman Returns because the suit is not as crude as the first movie's, as Bruce Wayne can afford better. Plus Cat Woman is only in Returns. Nuf said. 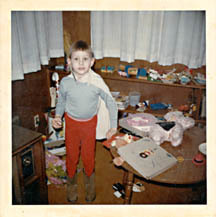 thought I was the one true Batman. and this was special to me. It was too special to share. To make a long story a little less long but still long, (sorry) I decided to share my dream with others. As I perfect my Batman suit over the years I occasionally find myself with extra pieces parts and variations. I occasionally offer these to my other "would be Batman" partners. 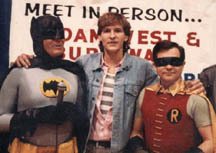 I can relate to all of the "would be Batman" Bat fans out there. right some of the wrongs of the world. be safe until he is needed again. combination could exist in the right person some day. share some of the same ideals. Enjoy.